If you have not yet tried out GameVillage for your bingo, slots and more, then now is a great time to give them a whirl. Besides having a great choice of bingo rooms and games available they have a great welcome 400% bonus offer. Simply deposit and spend £10 and play with £50 at GameVillage! If you would like to take advantage of this terrific welcome offer then just click on the button above (or below) and this will take you through to the GameVillage website. Select the large ‘JOIN NOW’ button to open the registration form. Once you have completed all of the relevant sections of the online form you can make your first deposit into your account. The minimum deposit is £10, although you can if you wish deposit as much as £500. 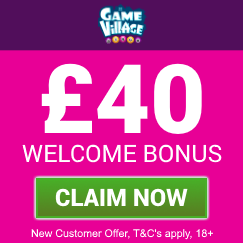 The welcome bonus is a 400% cash match so if you do fund your account with £10 you will be instantly awarded an extra £40 bonus for free, giving you £50 to play. The maximum bonus available is £100. 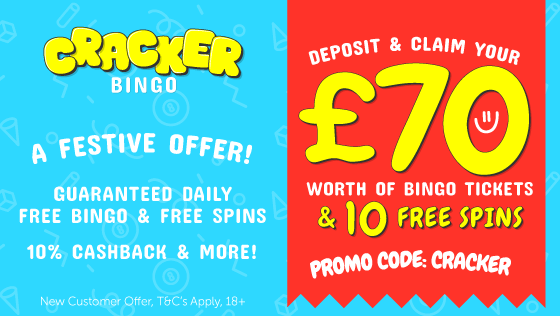 This is a great way to boost your bingo balance and is certainly value for money when trying out a new site as you have extra cash to join in the many games available at GameVillage. However, like all online bingo websites, any bonus money awarded is subject to wagering requirements. You will need to wager the deposit value and bonus award combined a total of four times on bingo or forty times on slots before you can withdraw any associated winnings as real cash. 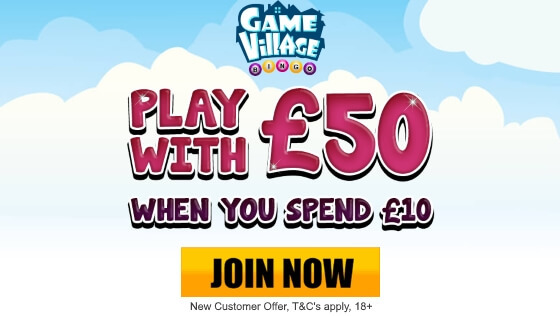 So if you are looking to try out a new online bingo site then we recommend that you give this site a go, especially with their great welcome bonus offer which means you can deposit £10 and play with £50 at GameVillage!